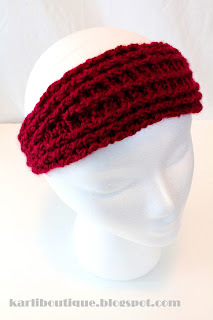 I just listed this scarlet red cable chunky headband in my shop. It's made from mostly FPDC and BPDC, and in a size 3 Satin Sport Yarn. Isn't it so Valentiney? 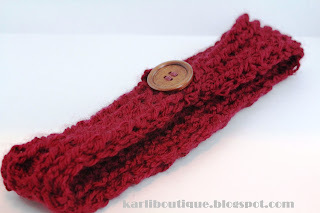 At the back, the wrap is adorned with, you guess it, an oversized wood button! I adapted it from a free pattern on the Oodles 4 Noodles site, by Carrie. I made a few so I have to get rid of some because let's face it, I will never be able to wear all my headbands in my entire lifetime!! While I followed the general outline, I had to add rows at important transition sites since I used a finer yarn and smaller hook for the detailing and to make the cables really pop out. 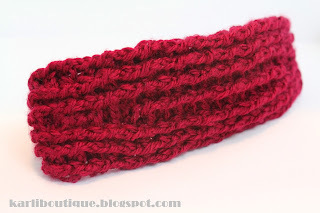 Check out Carrie's site for lots more fun free crochet patterns! !